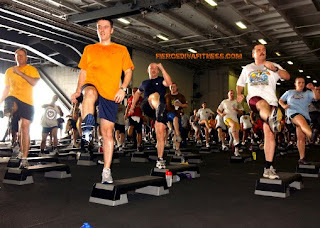 Fierce Diva Fitness: Real Men Do Aerobics! I have to admit that I laughed at this with you calling guys out! LOL! I have tried aerobics before, and I can attest that it isn't as easy as most people think. I don't know how most guys think on that, but I think you're right though. I haven't done that but a few times though. I still do a lot of running for sports I play. Thanks for the laugh, Fitness Diva! You have that name for a reason! Those folks are sooo lucky to have you as a teacher/coach/trainer! The guys are definitely missing out. lol...very funny!!! If guys actually took the time to see just how good a work out it is there would be more doing aerobics, but what guy wants to be the first??? Good for them! I am glad to hear that aerobics is not just for us women. Whats wrong with working out and loving it...I think its great and yes you'll absolutely get to meet lots of women. Don't be ashamed, if you enjoy it then just go...your buddies don't have to know, hahahaha. I say if something makes you feel good why would you stop, enjoy life and have fun! I believe so too. Working out is working out, so what if you dance a little, it still causes you to loose weight. I have a brother and he does that. I don't think it is any less manly. Nice post. I like how you called the guy out and he wouldn't even show up lol. As a guy myself, I guess the reason I don't do aerobics is just because I personally like using the free weights. I have nothing against men that do aerobics and I wouldn't say it makes them any less manly, but I do think that is what stops most guys from doing it. ha, the guys at my gym spend ALL their time weight lifting. Their idea of cardio is taking a stroll around the gym looking at chics, lol! I know that when guys think of aerobics, they think of those cheesy 80's videos with a bunch of women wearing colorful leotards and leg warmers. Guess what -- aerobics have come a long way since then! lol! PSP, I like to do both. Some days I'll do a heavy weights session and on other days I'll just go in a rock an hour of cardio via a step class, jump rope or running. My favorite is to mix it all up, though, and just get it all done! I love that you're challenging men to rethink aerobics, keep up the good work! i do aerobic, i dont care if peoples laugh at me, is for my health. period. did you know, aerobics exercises reduce the level of naturally occurring estrogen, a hormone that protects the colon. A possible explanation could be that men work more vigorously than did the women. Your pretty funny for a DIVA! I went to Aerobics for one reason, and one reason only. (I already had my exercise)Yep, I went for the Lady's! Aerobics? Haven't tried this yet. Sounds good. Hehehe! Don, you are a member of a very elite (and smart!) club! The guys that do show up in these classes have the odds all in their favor! John, your wife must be pretty fit! I was 'tricked' into one of those step aerobic classes one time by my coach and the hot instructor...haha...she made a bet I could not refuse. All I can say...beginner's class my you know what! And why not) I have many friends of men involved in fitness. I remember taking a class out of sheer boredom at college. I was around during winter break, no one was at the gym essentially except several people doing aerobic class. I can tell, after that class, I became hooked. A lot of these aerobic class are not just aerobic, but total body workouts. They also focus on overall fitness, not how much can you bench pres or do curls. It works on flexibility, endurance/stamina, and speed (depending on the class). It's a shame that many guys don't see the benefits of it.